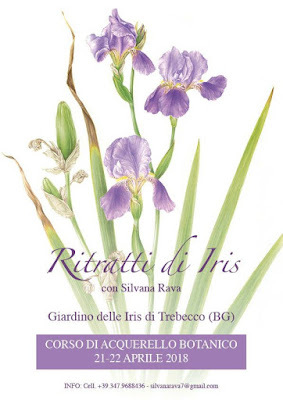 In the garden Le Iris di Trebecco, in the village of Credaro, Cristina Mostosi overcame the pain of her sister's violent disappearance 17 years ago. Beauty is everywhere, all you need is your eyes to see it, and according to Dostoevsky [it] "will save the world". It can even be cultivated, as Cristina Mostosi does in her garden, Le iris di Trebecco, in Credaro, [near Bergamo, Italy] taking care of the flowers of her father Luigi — it is a demanding and tiring but powerful job, because over time she has treated the deepest wounds of the heart, making grief sprout, turning it into something different. The irises are gentle and fragile looking flowers, they are found many in the meadows, along the streams, and on the riverbeds. Not everyone knows, however, how tenacious and robust they are. There was a time when the peasants had sown them on the steep ground, because their thick rhizomes made a natural fence. For the Mostosi family irises played an even more important role. In difficult years they have served as a barrier in the despair and void left by young Paola, the "little one," daughter and sister, barbarically killed seventeen years prior, when she was only 23. "A splendid girl," Cristina remembers, "intelligent, full of life." The iris garden is in the country house, a small and cozy space set in a medieval castle. When the Mostosi family bought it, beneath its windows it layed, rugged, uncultivated, full of weeds, but still fascinating, well exposed to the sun, with a priceless view of the Oglio River and the Castle of the Count Calepio. 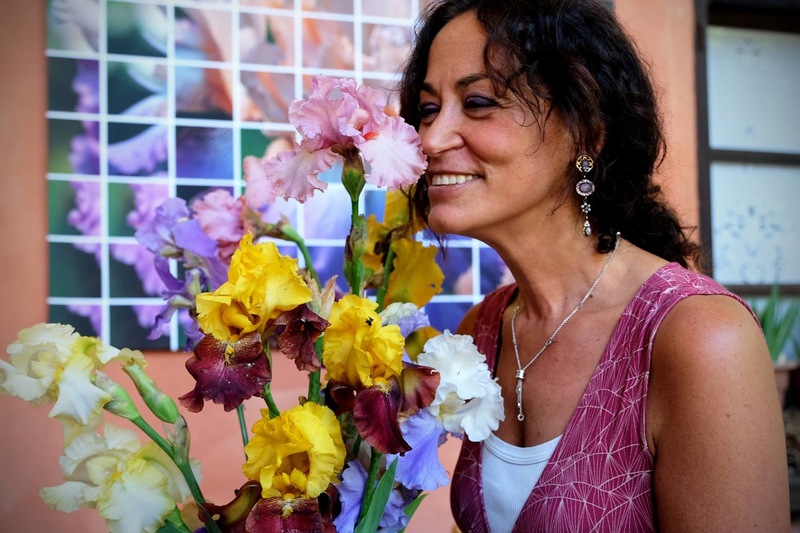 "The idea of ​​the iris was my mother's," says Cristina. "Originally from Grumello, she remembered that the peasants planted them in the ditches because the rhizomes in time formed real dams and also compacted the ground." That house is full of happy memories: Cristina and her brothers spent carefree summers of their childhood together, running through meadows and woods and bathing in the river. "Here the soul of my family is preserved. I still remember when we planted the first irises, of the most common type, which they call "Germanic". 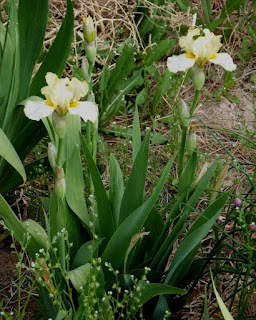 Over time, on their travels, my parents discovered other species, other stories related to these irises. My father was very passionate about gardening, he followed a hybridization course, he learned to create new species and colors for himself. He dedicated an iris, red and yellow, to the city of Bergamo. He also managed to obtain a particular shade of red, a very rare color for iris, and in 2004 he won a prize from the Italian Iris Society's Florence Competition. He was in close contact with other hybridizers throughout Europe. This passion supported him in the years that followed the death of my sister. Faced with such a great pain, impossible to express and overcome, one must still cling to something beautiful. My father really believed in it; he was a creator of beauty, and it helped him to survive, to get away from the horrors of the world and to find peace again. Every morning at 5:00 a.m., he was already in his garden. He considered it an open-air laboratory, his shelter, and then he returned home to Torre Boldone, at 7:30 a.m., just in time to be next to my mother when she got up. My mother, instead never managed to overcome her daughter's loss, and went from one exhaustion to another; nobody was able to console her, and she took refuge in a world of her own, where she remained until her death." The life of the Mostosi family was hit hard by the murder of Paola, and everyone reacted differently. Cristina, who at the time had two young children, after a short time separated from her husband: "Such a great tragedy leads one to question one's own life. This can strengthen a relationship or hurt it by exposing its fragility. I rolled up my sleeves and went ahead." 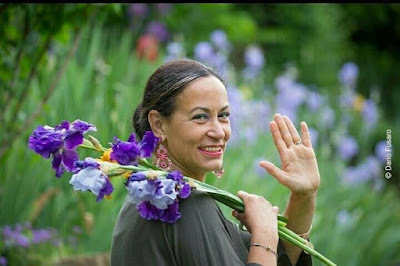 In the past, Cristina did not spend much time in the garden: "Sometimes I helped my father, with love but without a particular desire to do so. But, he knew me well, and he knew how he had chosen a positive activity for me." When Luigi died a few years ago, he chose, in fact, to entrust Cristina with the care of the iris garden: "It happened suddenly," she explains about his death, "from a heart attack; I stayed for a long time wondering what to do, saddened and lost. I enjoyed the bloom season, then left Castello Trebecco for a few months because I had to mourn — my father was my rock, my safe harbor, and now he was gone. By that time, my brother had lived in Monte Carlo with his family for over twenty years, so suddenly, without my father I felt really lonely. When I came back to Castello Tebecco the garden seemed like a deserted, abandoned place. I realized that as his age progressed, my father had neglected the maintenance work and so a radical garden restructuring was necessary. I called several gardeners, but no one wanted to accept the task, because it was a task too tiring, on a steep slope, with many steps to do. I understood that I would have to deal with it alone. I did not know enough, so I started studying, creating a small library. I realized that taking care of a garden does not only mean keeping the plants alive but also nourishing the garden's character and spirit." Cristina decided to keep the footprint her father Luigi had established: "I cleaned up the paths he had traced, I rebuilt the dry stone walls that supported the terraces and steps with the same material he had chosen. What I have chosen, volcanic tuff, comes from Tuscany, it is natural, it camouflages a lot, you almost do not see it, it gives the whole path a pleasant, harmonious look." The bricks, however, are heavy: "It was a huge job, and I have yet to finish it. Fortunately, I had my friends and family with me. An incredible chain of solidarity has been activated. My cousins ​​helped me above all, and the company has become an opportunity to get together, keep in touch, do something together. Thus our bond strengthened." The iris garden transformed Cristina's life: "I changed my life rhythms to follow those of nature. I earn a living working in a bank, so I live in the city, but for some years I obtained a part-time job that allows me to move to Castello Trebecco from Thursday to Sunday and get my hands on the ground. I get scars from the work, my skin gets cuts, I wear the marks of this work on my skin, but it gives me a lot of satisfaction. Every April I open the garden to the public, offering guided tours; and I started to participate in some trade fairs, like Orticola in Milan, an important and beautiful experience. I'm only at the beginning of this process but I've already had visitors from many parts of Italy, and even from abroad. Now my children Giulia and Fabio attend university and live in Milan, which means that I have more time available, and I dedicate it all to gardening. I am gradually discovering new possibilities. I have created new relationships with cultural associations, and tourist organizations in the area." 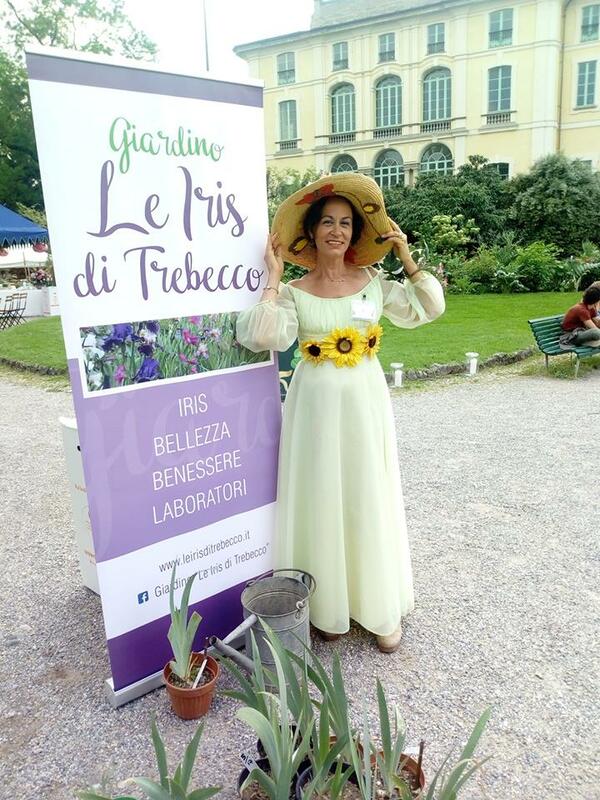 Thanks to meeting Mariagrazia Dammicco, president of the Wigwam Club Historical Gardens of Venice, Cristina participated for two years at the Festival of the Gardens of the Serenissima, where she brought her irises. On one occasion she met Luciano Cecchetti, curator of the Vatican Gardens and Castel Gandolfo, who transmitted the most important requirements for a good gardener: fertile soil, strong hands and a lot of patience. 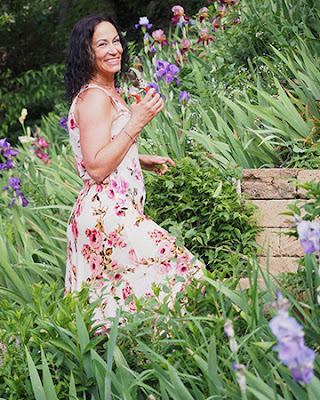 "His advice has helped me to revive the garden, trying to give it a personal touch, putting the emphasis on beauty and wellness, pushing me to enrich it with all that makes me feel good. Then, the garden has revived me, offering me new perspectives, unexpected thoughts and opportunities." 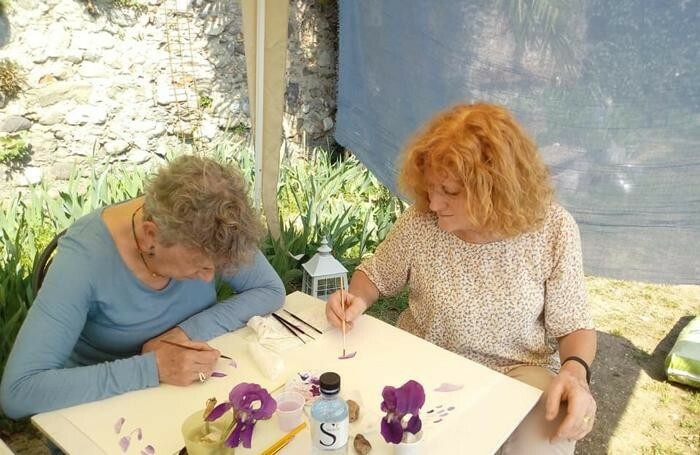 Cristina never stands still: she organizes lectures, meetings, workshops of botanical and traditional watercolor in the open among the Iris of Trebecco, she lectures at school. 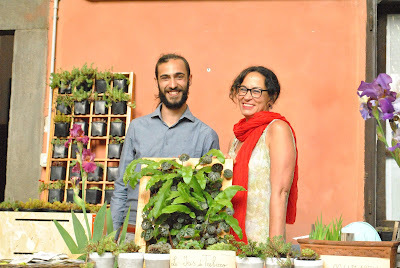 "I talk to students about the care of plants as a way to take care of themselves, to reappropriate personal traditions and habits that are often lost by living in the city, where it is difficult to notice even the passing of time and the seasons." The garden of Castel Trebecco is fertile, because it generates beauty in many ways, stable, thanks to its flowers, and symbolic: "I continue to generate ideas, for example I am thinking of starting some collaborations with community associations. I would like my garden to become a beneficial source not only for me but also for others." And to think that all began with the need to contain a land that was in danger of collapsing: "In Greek mythology iris is the name of the messenger of the gods, a winged girl who rides the rainbow. My flowers are sturdy, resistant and rustic, and at the same time spread delicacy and charm with their appearance, bright colors, and their beautiful scent. I tried to recover all the species of my father's, and in the future I would like to follow a hybridization course and maybe an internship in Holland or France. For now it is only a dream. I will realize it when I retire and I can devote myself to irises fulltime. The garden has changed my horizon, it has taught me that I need very little, it has brought me back to the essential, to what gives meaning to life." 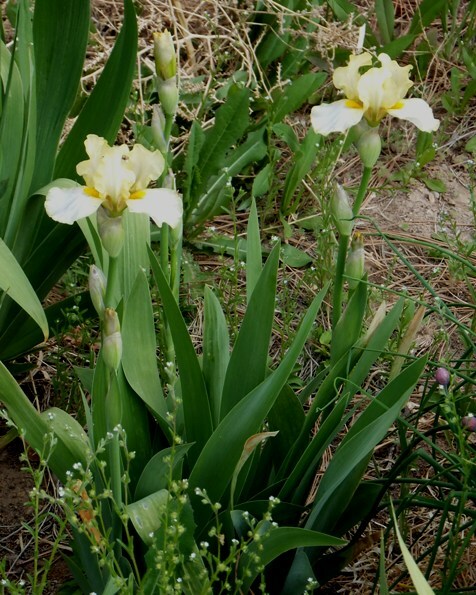 There are three classes of median irises that span the interval between the standard dwarf bearded (SDB) and tall bearded (TB) classes. The intermediate bearded (IB) are mostly the result of crossing TBs with SDBs, leading to plants intermediate between the two, both in height and in bloom season. The miniature tall bearded (MTB) come from varied backgrounds, but must meet exacting standards of delicacy in height, flower size, and stalk proportions. The final class, the border bearded (BB) are derived almost exclusively from the TBs, but with height less than the 70 cm (27.5 inches) that is the boundary between the BB and TB classes. The BB class is unusual in that it has no real “center of gravity” of its own; rather it represents the smaller “tail end” of the TB class. Many BBs are registered at a height of 27 inches, just barely below the upper limit of the class, and are hard to distinguish in practice from TBs at the lower end of the TB height range. One might ask if there is really a need to place such irises in a separate class. Proponents of BBs have long had a vision of the class that sets it apart from the TB class. An ideal BB is not just a TB that is an inch or two shorter; rather, an ideal BB is a reduced TB in all its dimensions and proportions, including foliage, branching, flower size and form. While it is not intended that they be as delicate as MTBs, they ought to be “halfway there”, as it were – they should be esthetically medians, instantly distinguishable as diminutive and elegant irises in their own right. Part of their value comes from being useful in garden design in situations where TBs would be out of scale or overwhelming. They should be more about charm than grandeur. Some of the best median hybridizers have pursued this ideal with great care, selecting plants for introduction that are modestly proportioned, perky, and might more easily be mistaken for IBs or MTBs than for TBs. Early BBs like ‘Frenchi’ (B. Jones, 1959) and ‘Tulare’ (M. Hamblen, 1961) were exemplars of this ideal in their time, as was ‘Brown Lasso’ (Buckles by Niswonger, 1975) which was the only BB to win the American Dykes Medal. ‘Cranapple’ (Aitken, 1995) is a worthy example of more recent vintage. This is difficult work, and not always appreciated; many people buy BBs just as they do TBs, by looking at the catalog “glamor photos” of single blooms and choosing exciting colors and patterns, with little attention to plant proportions or esthetics. 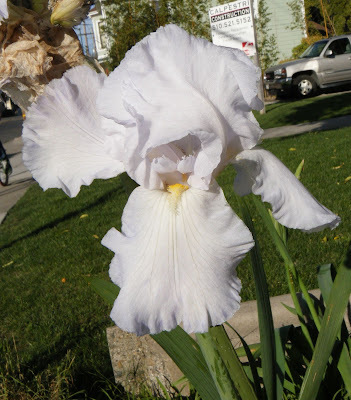 A large, blousy iris with the latest TB color pattern that does not meet the BB ideal may sell more than a carefully selected, lightly ruffled, charming BB in an unexceptional yellow, violet, or white. One might argue that this doesn’t matter in the big picture of things. 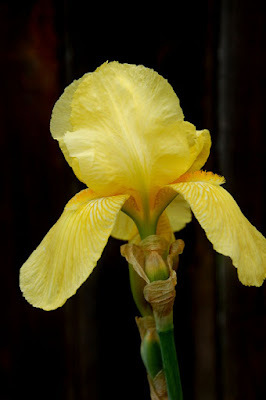 People like what they like, and if they enjoy an iris, who cares about its failure to meet some elitist ideal? On a case-by-case basis, I think that is a valid perspective. 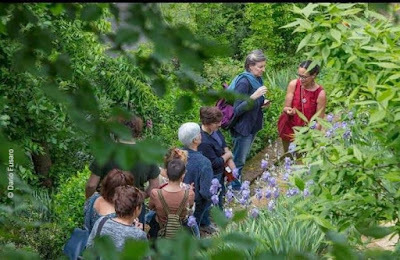 Where it becomes problematic is when the notion of the class becomes so blurred that it ceases to convey anything clear to gardeners, and those seeking smaller, well-proportioned medians can’t trust the BB designation as meaningful. We all have a role to play in maintaining the distinctiveness of the BB class. Hybridizers can work more with lines that are intentionally devised to produce BBs, rather than taking most of their BB introductions from crosses intended to produce TBs. Tetraploid MTBs and smaller bearded species can be used to “tame” the TB genes and keep plants in scale. Judges must strive to be more scrupulous in maintaining the standards of the BB class. Alas, color novelty and hybridizer reputation often bias judges away from a more sober consideration of shape and proportion. Finally, buyers can reward hybridizers who keep the BB ideal in mind. Best of all is to buy BBs you have seen growing in a garden, and which you know to be consistently diminutive and in proportion. If you do buy “sight unseen” (as I often do), give preference to BBs registered in the 20-24 inch range, rather than 26 or 27 inches, as so many are. I also check pedigrees, looking for a preponderance of BBs, MTBs, or SPX irises in the background of a new BB. Finally, even a single-bloom photo can convey information about the scale of the plant, if you know what to look for. A bloom that is perky, flared, and not too ruffled is more likely to be in scale than one that is more flamboyant but not so flaring. I have chosen not to use this blog post to give examples of modern BBs that I think are particularly fine or particularly poor examples of the class ideals; that is for each person to decide for themselves. The BB class need not be just a spillover for short TB seedlings; it has much to offer the discerning gardener. Wonderful irises come in all sizes! If you found this post interesting, please check back in January, when noted hybridizer Kevin Vaughn offers his reflections on the history of the BB class and promising avenues for its future development. While Clara B. Rees (together with her sister Ruth) introduced only 28 iris during her lifetime, she remains one of the most impactful American iris hybridizers, largely through her first introduction, the astounding iris breakthrough 'Snow Flurry' (C.B. Rees 1939). 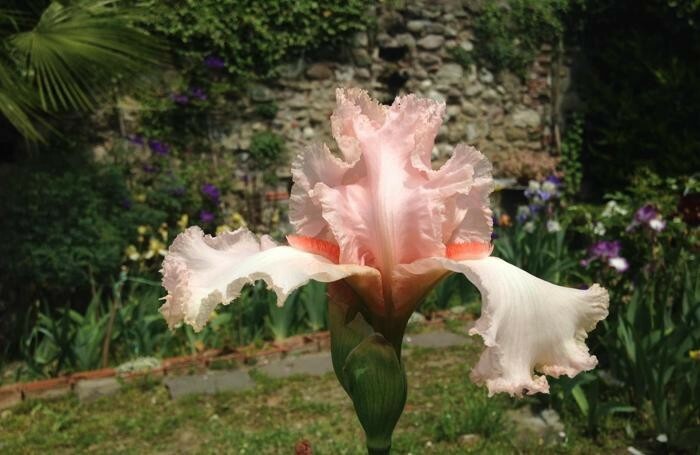 'Snow Flurry' was the result of a cross of the white iris 'Purissima' and pastel orchid pink 'Thais.' The resulting seed pod had only two seeds, one of which was shriveled and was discarded. The other produced a blue-white iris of unparalleled size and ruffling, held on large well-branched stalks. 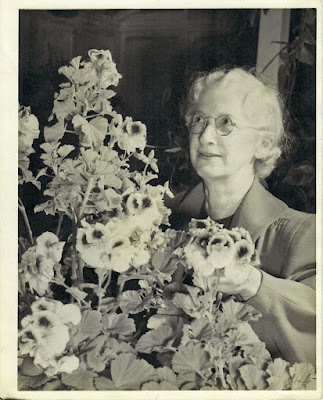 As I have related in a previous blog of Carl Salbach, Ms. Rees' sister Ruth cut several of its flowers, securing them with tissue paper in a shoebox, and made an all-day journey by train, ferry, and trolley all the way from San Jose to Salbach's home in the Berkeley hills. Upon seeing the magnificent flower Salbach was so amazed that, after seeing the plant in Rees' San Jose garden, he purchased her entire stock. He also kept a stalk in cold storage until the AIS convention in Oakland the following week - upon its presentation to the assembled irisarians there were audible gasps, and numerous orders of rhizomes were made. Its premiere into the iris world was so remarkable that an article on the subject appeared in the local newspaper. 'Snow Flurry's breeding potential was recognized immediately by hybridizer Orville Fay, who went on to create numerous award-winning 'Snow Flurry' progeny. Although producing no pollen, 'Snow Flurry' proved to be an excellent pod parent for many iris, passing down her most excellent traits. 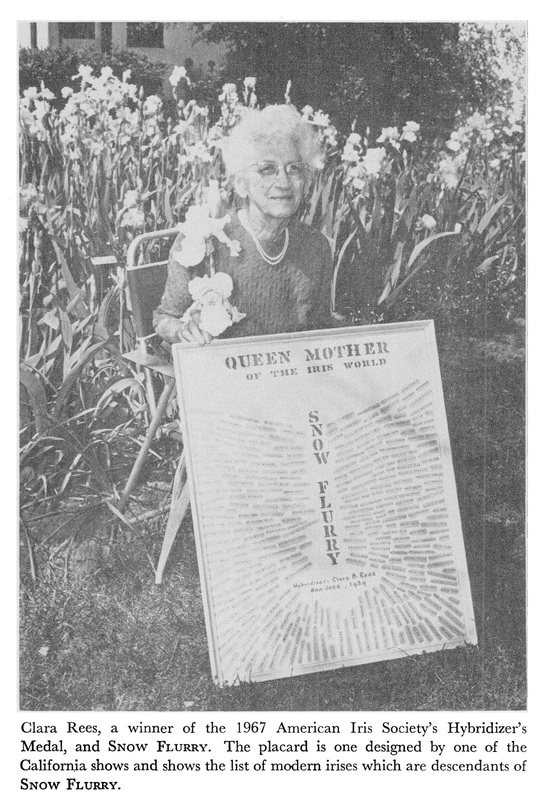 The photo below from the January 1968 AIS Bulletin shows Ms. Rees with a stalk of 'Snow Flurry' and a board showing its multitude of progeny. Clara B. Rees was born and lived her early life on a farm in Ohio. It was here that she learned her love of plants and flowers, and made her first hybridizing efforts with amaryllis. After her father passed away, she, her mother, and her sister Ruth moved to San Jose, California to be near her other sister Mildred (Mrs. Bert E. Loehr). Although Clara had a strong early interest in tulips, the San Jose climate made working with them impractical, and she began concentrating on iris instead. She and Ruth (who referred to herself as Clara's "Girl Friday" in iris matters) soon filled the garden of their San Jose home with many of the latest varieties of iris, as well as many other plants. Clara raised 600 to 1000 seedlings per year, but was very selective in what she chose for introduction. She introduced a number of 'Snow Flurry' progeny herself, including the yellow-tinged white iris 'Easter Sunrise' registered in 1944. 'Easter Sunrise' was the parent of the lovely yellow 'Sarah Lester,' a joint introduction of Clara and Ruth. Late in her life Ms. Rees produced a number of large, ruffled introductions, such as 'Light and Lovely' (C.B. Rees 1966). 'Touch of Elegance' (C.B. Rees 1962) has a tangerine beard as its focal point. 'Waltzing' (C.B. Rees 1969) shows remarkable form and ruffling for its time. Clara B. Rees received numerous honors in her lifetime. 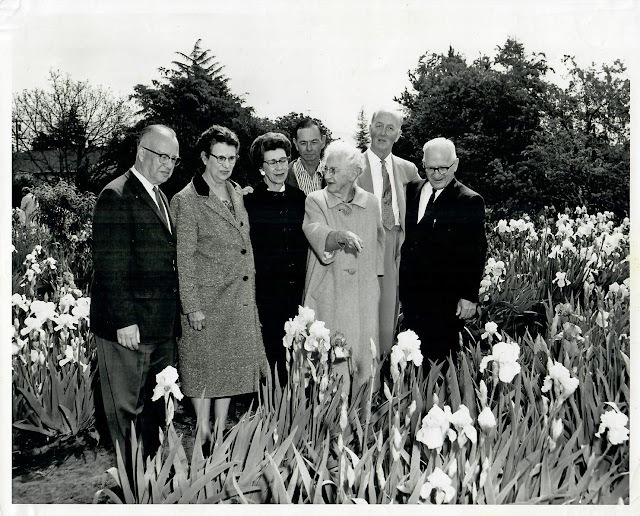 She received the AIS Hybridizer's Medal in 1967, and the AIS named their annual award for best white iris the Clara B. Rees Cup. 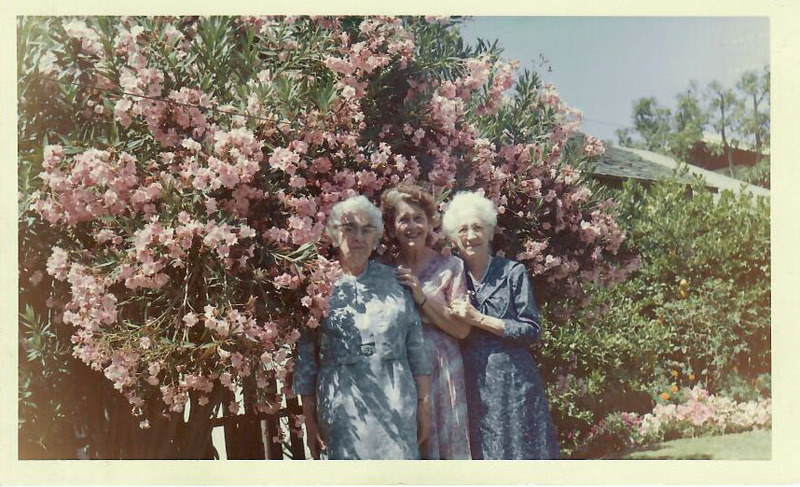 In 1957 a group of irisarians in the San Jose area organized the Clara B. Rees Iris Society, a club that is still active today. Clara B. Rees passed away in 1970 at the age of 90. Wherever iris are grown, Clara B. Rees and 'Snow Flurry' will be remembered. Distinguished irisarians at a Region 14 spring meeting in San Jose admiring a clump of 'Snow Flurry'. Front row from left: Roy Oliphant, Bernice Roe, Melba Hamblen, and Clara B. Rees. Back row from left: Larry Gaulter, Harry Randall, and Robert Carney. Photo courtesy of Bryce Williamson. Both Phil Williams and I woke up early Tuesday morning, knowing we had a long day ahead of us. The Best Western did provide a breakfast, saving us the time to go look for a place in Merced. And then it was on the road again for the drive up to Superstition Iris Garden in Cathey’s Valley. On March 22, Superstition received 5.21" of rain with 3.25" of it coming in a one-hour long, vicious thunderstorm. There was a lot of damage in the local area with many bridges washed away. As a result, we could not take Old Highway into the garden, but had to use School House Road instead; however, before we went to the garden, I wanted to see the Detwiler Fire damage so we drove up to the bustling metropolis of Mariposa. Ironically last year’s fire has resulted in wonderful wildflower bloom this spring. Because Superstition grown medians and arilbreds along with tall bearded, there was a lot to see in the garden. As always, Rick Tasco and Roger Duncan were gracious hosts, letting us first wander around in the named varieties rows before we walked the seedlings with Rick. 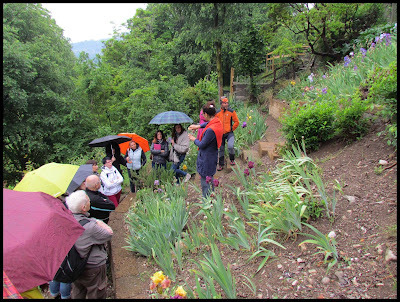 When we were ready to leave, Roger provided wonderful directions to John and Leslie Painter’s garden by Lake Barryessa. Those great directions saved at least a hour of time on that leg of the on the road trip. Superstition has a printed catalogue and it can be obtained by sending $1.50 to Superstition Iris Garden, 2536 Old Highway, Cathey's Valley, California 95306 for a two year subscription. They can also be reached on Facebook or in email at randrcv@sti.net. Our garden in northern Virginia, zone 6, at an elevation of 1100 feet with alkaline soil, is almost a perfect location to grow bearded irises. In the autumn the colors of the reblooming irises blend with the leaves of the mountain maples, the black gums, persimmons and dogwoods. As I am writing this article in mid October, the rebloomers are putting on quite a show along with the changing leaves. Our weeping cherry tree is changing color and the winterberries are starting to lose their leaves while our resident Mockingbird is tirelessly guarding his hoard. Each day brings a new surprise while stalks appear as if by magic. I thought 'Lord of Rings' matched the changing leaves of the cherry tree so well. It is so peaceful to wander around the garden and enjoy the sounds and colors and even the smells of autumn. Our Katsura tree now smells like burnt brown sugar and somewhere nearby, someone is burning leaves. A customer called a few days ago and asked about fragrant irises that matched their color. I remembered a few, but I had some rebloomers open and I checked the fragrance of 'Persimmon Pie' and remembered why we named it that. Also, 'Mango Parfait' was reblooming and it smelled like a fresh mango. 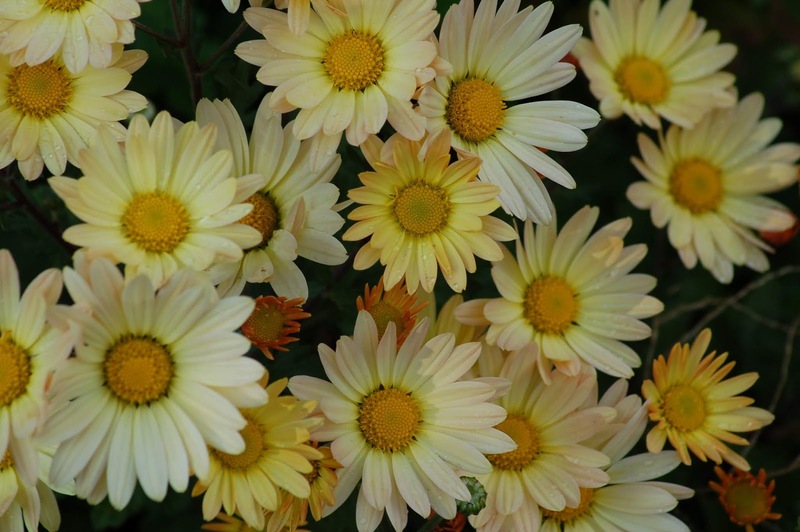 What would a fall garden be without the chrysanthemums? There are perennial mums that come back every year and their colors blend in well with the rebloomers. Ours grow beside our entrance and I must remember to plant some among the irises next spring. Enjoy the crisp fall weather and all of the sights, sounds and smells because ... Winter is coming.